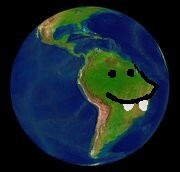 This is what children and other illiterates believe Earth looks like from space. Green and goofy. LONDON, England -- The Royal Society announced today that Earth has almost caught up to Mars in their millennia-old Sandiest Planet contest. The depleted soil and washed-out look of the two heavenly bodies is now only differentiated by the blue of the Earth's oceans, and scientists and environmentalists agree that if present trends continue those aren't long for this world either. As seen from satellite images forty years apart, Earth's deserts have rapidly gained ground on Mars. Ecology experts and logging fans excitedly predict that the deforestation of the Amazon and other tree-infested areas will continue into the foreseeable and godforsaken future. Humans, not resting on their laurels of having cut down every tree in some entire nations and formerly landscaped islands, have now set their considerably far-seeing sight on the last remaining virgin stands in England and Siberia. The Royal Society report provides a timeline of the planet's race to the finish line. It shows what countries like North America and Europe looked like six hundred years ago, compared to what they look like now. On one hand, plush jungles and literally acres of grasslands where buffalo roamed and deer, antelope, wolves and jaquars played. On the other, barren soil as far as the eye can see. "Yes, amazingly, ours is becoming a desolate planet, just like Mars. And not a moment too soon!" says forensic zoologist Jack "Smilin' Jack" Hanna. "In my lifetime, the rate of desertification has gone up 300%, and I've happily loaded my stock portfolio with camel, bottled water, body bag, and tent futures. I'm counting my blessings as we speak, because these babies are going through the roof!" What the planet really looks like under its clothes. That is the middle-eastern country of Africa scowling at the lens, nothing but sand, clouds, and chunks of more sand. Crocodiles are in there too, probably covered with sand by now. Royal Society officials and longhaired hippies held a joint news conference today to explain the surprising sandification of the planet. "It's all in what we eat, man," said hippie spokesperson, Wildflower. "Do you know that what you think of as farms were formerly forests, prairies, and meadows? That 90% of that farmland is used to grow corn and soy feed used to fatten up cows and pigs? Farms occupy millions of square miles of land, man, and they are little more than today's cattle feedbag and tomorrow's barren desert. The only way to really save the planet is to stop eating corpses!" Cutting off her microphone and kicking her in her hairy shin, Royal Society spokesperson Dontkare Neverwill inspired the journalists by exclaiming "Don't bring us down, Wildflour. We can be as sandy as Mars within a few years with just a little more effort. And corpses you spray? Piffle. Ronald McDonald, you go girl, and may the lifeless body of Ray Kroc always stand as a beacon of hope to those who want to see Mars bite it big time. We're number one! We're number one!" A luncheon followed the announcement, where scientists, hippies, and journalists continued their discussions over ham and beef, chicken and turkey, lamb and seafood, and some coleslaw.